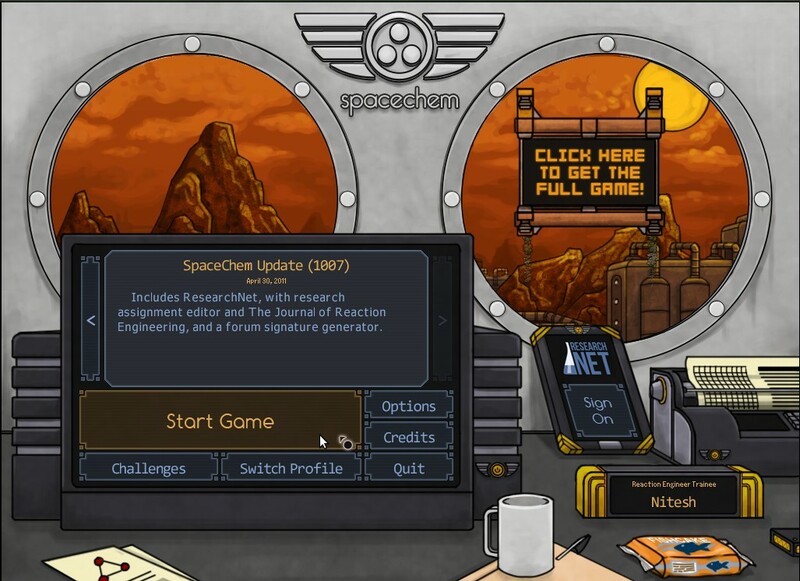 SpaceChem is developed by Zachtronics Industries. In the game you take on the role of a Reactor Engineer working for SpaceChem, the leading chemical synthesizer for frontier colonies. By constructing elaborate factories to transform raw materials into valuable chemical products your aim is to streamline your designs to meet production quotas and survive encounters with the sinister threats that plague SpaceChem. If above explanation is a little bit overwhelming - In SpaceChem you combine atoms to form molecules and move, grab, rotate them over a pair of circuits. You have to try to fit different types of actions for each level to get everything in tandem between both the circuits. On each of the circuit, you get a Waldos, a helper which executes the command you lay down on the circuit path. The ultimate aim is to create a reaction where the final result is creation of a chemical substance. The game contains over 50 mind twisting puzzles and fans of chemicals, alchemy and periodic tables will find this game to be highly fun. You can try the demo to know more about the game. Full version is available for $15. The demo includes deb packages for easy installation on Ubuntu and detailed instructions for other distribution are available on the download page.